Mash: "You two are so pretty and fresh!" Kei: "You have a good eye." What's a few casualities when you are just doing your job? As trouble consultants for the 3WA (World Welfare & Works Association), Lovely Angels Kei and Yuri are the Original Dirty Pair, and are most certainly Damsels In Destruction. Their mission: get the bad guys. Their weapon of choice: bazooka. Standard issue uniform: bikini. Our gals take gaff from no one, and you'll be lucky to escape with your lives, since these girls put the mayhem on maximum and collateral damage is always high. They may seem harmless enough on first glance, but don't be fooled, they didn't get the title "trouble" for nothing. This disc contains the final five OVA installments. Their first assignment pits them against a "ring" of counterfeiters run by the mob. While the girls did "vow" to get their man, Yuri's cover is not so thinly "veiled" as the investigation leads to Wedding Panic. Is there anything that can be done to "alter" the inevitable outcome? Next, the girls are going to have to "hustle" to get to the bottom of this caper, and I don't mean a trendy 1970s' dance craze! To make matters worse, they are up against an old colleague with a grudge in Revenge Of The Muscle Lady. Kei will get herself on the ropes before the job is done, as her amazon opponent feels a little pummeling is in order. We will pump you up! Don't you hate it when people don't act their age? The Dirty Pair find the solution to aging cream in Sleeping Beauty, when the discovery of a cryogenic chamber reopens a 20-year-old case. Kei's maternal instincts kick into high gear as our babes in bikinis uncover the truth from the distant past, and I'm not "kidding." So you think you can't tell much about a person by their looks? Well, in this installment, Red Eyes Are The Sign Of Hell. A fragile peace process is being disrupted by a mysterious band of black-clad warriors. Can our trouble consultants unravel the enigma without blowing the whole place up? I doubt it. Finally, Kei and Yuri go undercover to solve a series of murders on a space trading station. There's dangerous cargo as the ladies get to the bottom of this one in We Are Space Truckers. Didn't I warn you to lock up all munitions in a safe place? The series was born after Takachiho Haruka, author of the Crusher Joe space opera novels, was inspired by a comment made during World Women's Wrestling Association (3WA) match he was attending with a fellow science fiction writer. This led to the creation of a series of novels, originally serialized in SF Magajin, beginning in 1980. 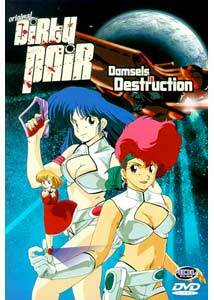 After a cameo in the Crusher Joe movie, the Dirty Pair were commisioned for a 26-part TV series in 1985, of which only 24 episodes ever aired, as the final two were released as the From the Lovely Angels with Love OVAs some time later. With character designs by Urusei Yatsura's Dokite Tsukasa, the TV series disgarded much of the tone of the novels in favor of more silliness, causing the lackluster response of the one off OVA Noorandia no Nazo (aka Mystery of Nolandia) that was also created during the TV series run, but was closer to the darker stylings of the novels. A feature film, Daatipea (aka Project E.D.E.N.) was released in 1987, after which the Original Dirty Pair ten part OVA was produced, though with new costume designs, and different continuity than the TV series. A final "classic" Dirty Pair OVA, Bouryaku no 005-bin (Intrigue of Flight 005) was released in 1990. In its next incarnation, the girls get a facelift, when character designer Kimura Takahiro, (AD Police, Kimagure Orange Road) was brought on board for the 1994-1996 Dirty Pair Flash OVAs, which ADV is also releasing�who loves ya baby!. Technically these aren't supposed to be the same girls, but with the same names, and similar dispositions, I'm not going to argue with them. Image Transfer Review: Aside from a little bit of ghosting in a few places, this series looks great. Colors are slightly muted but solid, and black levels are fine. Minor aliasing here and there, and a few print defects round out the criticisms, but there isn't a lot to complain about. Original Dirty Pair rocks. Audio Transfer Review: Like the last disc, the Japanese stereo track is solid with clean audio and appropriate directionality. The barrage of explosions won't be propelling you out of your seat or anything, but still comes across well for an older mix. If it is your preference, an English dub is also provided with optional song subtitles. Extras Review: The Original Dirty Pair trailer is included again, plus the clean closing credit animation. Trailers for Arc The Lad, Orphen, Those Who Hunt Elves, Blue Seed, Dirty Pair Flash and Getter Robo are included. As with the first disc, playing from the menu with the English soundtrack gives you alternate angle title screens, where the Japanese track gives you the originals (though I wish they had subtitled these). Switching languages during play, doesn't invoke this. I did note one subtitle glitch immediately following the title screen on Revenge Of The Muscle Lady, where the first subtitle flashes onscreen but disappears immediately, which I suspect is due to it occuring immediately before a chapter break. This may not be applicable to all players. Like the first disc in this OVA set, Original Dirty Pair: Damsels In Destruction is another great collection of action and skin filled adventures. Each episode is self contained, and provides a new scenario for our gals to do battle in. Humor is perfectly integrated with decent storylines and plenty of destruction. This is great, old time anime, unfortunately, not enough of it is available on DVD yet, a situation I hope we see remedied in the not too distant future.